This week I discovered the World Movies channel on our version of cable. I probably shouldn't quite put it like that. I mean, it isn't like I am the first person ever to find it. More the discovery was that when I take a little time to look closely at the schedule I find numerous movies that I think I might like to watch! Perhaps unsurprisingly a number of them had food type connections and several of them are French. I therefore thought I might start an irregular and possibly infrequent series of posts about some of these movies. It could be even more irregular than I anticipate because my ability to watch these movies that I have recorded is somewhat impeded by the fact that I would need to actually be in charge of the TV for long enough to watch the movies but we will see how we go! 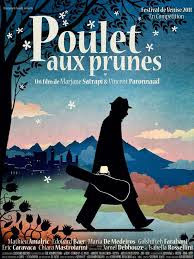 The first movie that I am going to focus on is the French movie Chicken with Plums. The movie is based on Marjane Satrapi's graphic novel of the same name. Whilst I read and loved her Persepolis graphic novels I had never read this book, and in fact it was only as I got part way through the movie that I realised that this movie was based on a book, let alone a graphic novel. In addition to writing the book, Satrapi was one of the directors. Nasser Ali is a world famous violinist. He travelled the world for many years before returning to his home in Tehran, marrying and having children.. He is a somewhat morose character, as evidenced by the fact that when his beloved violin is broken and he can't find another to replace it, he simply decides that he wants to die. Over the course of the next few days we get to know Nasser's life story as narrated by Azrael, the angel of death. From his childhood to his true love, his marriage, the lives of his children (including glimpses of their future lives), his relationship with his family and so much more. I mentioned before that this movie was based on a graphic novel. This is a live action movie (with one short animated section) but you can definitely see the graphic novel influence. The setting is Iran prior to the revolution, but it is mostly a picture book rendering of the city of Tehran and the countryside. The action varies from over the top humour to deep poignancy, with perhaps some magical realism thrown in. It is a compelling mix as you don't necessarily know what is going to come next. And yet as a whole, the movie feels cohesive. The final 20 minutes of the movie is an amazing montage of Ali Nasser's life over the last 20 years. Whilst it repeats some of what we already know from the film, these are often displayed from different perspectives and there are other revelations too. Visually it a gorgeous feast for the eyes and I ended up watching that section of the movie several times because it was just so beautiful, so touching, so well done. In fact, I might have to go and watch that last 20 minutes again right now. While the whole movie is worth watching, I would strongly encourage people to try it out just so that they can get to that last 20 minutes too, and probably watch it multiple times like I have! 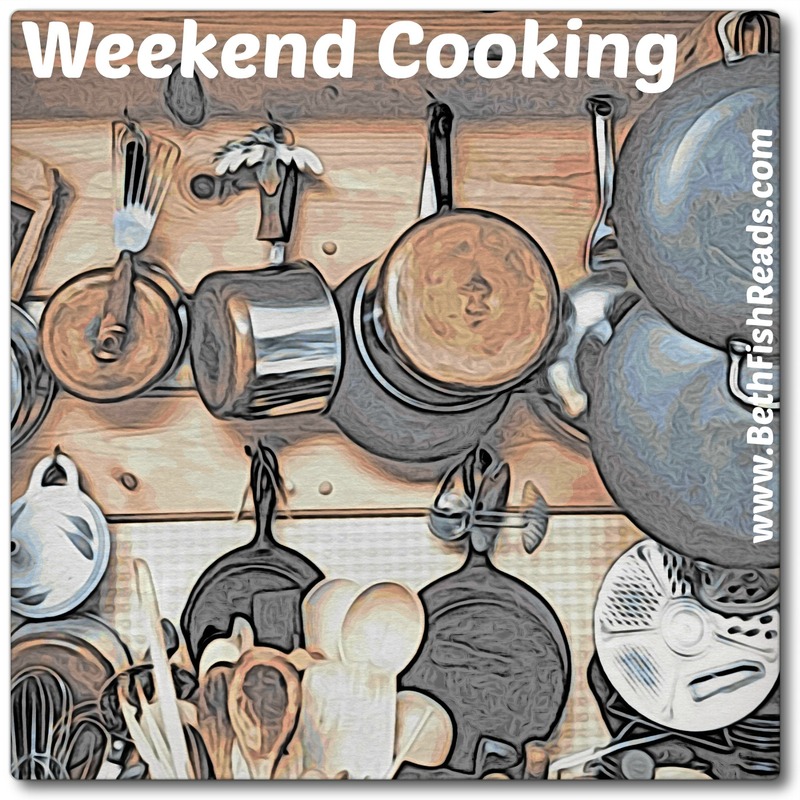 Of course, given that this is a Weekend Cooking post, I do feel as though I need to tie it back to food. The title of the story is a reference is a fact that Nasser Ali's favourite dish is Chicken with Plums. Whilst Nasser and his wife are pretty much in an unhappy marriage, she tries to snap him out of his depressed funk and to show that she does care by cooking his favourite dish. It did have me wondering what kind of dish it is. Obviously, without the author confirming which dish it is precisely we won't necessarily know, but I did find this video which I thought was interesting and the dish looks quite tasty too. That's very creative and I like the idea of combining chicken and plums. Sounds quite juicy! What a cool story too. I must confess Tina, it's not a natural combination I would have thought of! New to me book (I've read several of her GNs, but never heard of this one) and new to me movie. I could absolutely see the graphic novel influence in the movie trailer. And the chicken dish looks good and easy. My mom makes a similar chicken dish with prunes and apricots that I love. I am glad you could see the influence Beth F. At various times in the movie it was more marked than others. Carole, I have a couple more in the viewing queue that I will hopefully get to soon and write about too. I've never heard of Chicken With Plums, and would have never thought of putting them together, but since I love both, I plan on making this dish soon. I will be interested to hear if you do try making the dish Vicki! I know exactly what you mean when you can't often get access to the tv... I'd love to have world movies, but it would mean even more sport on the tele too- there seems to be more than enough on free to air. This sounds an intriguing movie, and I'd love to hear about more movies that you come across. I've been watching a few French movies lately, and keen to find more. I'd love that poulet aux prunes too. P.S. 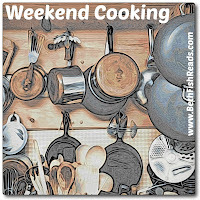 Thanks for reminding me about weekend cooking. I can contribute this week too. Louise, I should have mentioned that the reason why I was looking on the World Movies channel was to see if they had the movie Populaire that you talked about on your blog recently! I imagine that the plums would be delicious with chicken. All sweet yet tart, and very tenderising on the meat. Yum, Marge! Vicki, it would be interesting to try one day. Certainly a bit out of the ordinary for us. That chicken dish looks wonderful and the movie and book sound so good. Thanks for sharing. I can certainly recommend the movie Diane! The others definitely sound good too. Did you like the movie? I read the graphic novel earlier this year and did not like it at all. Persepolis, on the other hand, was very good. I did like the movie Christine. What didn't you like about the book!